The numbers in German are cognates of their English equivalents. German also has both cardinal and ordinal numbers, as English does. Cardinal numbers are the numerals used to count (one, two, three). Ordinal numbers are adjectives that express a relative position in a series or order (first, second, third). Not all German numbers must be memorized. 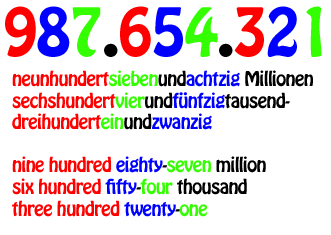 Knowing the basic numbers — i.e., from 0 to 20, multiples of 10 to 100, and then the name of each successive place value — and recognizing the pattern that German numbers follow is enough to figure out how to say any number in German. ♦ The suffix –zehn is a cognate of the English –teen, meaning “ten”. German numbers ending in zero (except 0 and 10) have the suffix -zig (or –ßig for 30). ♦ When followed by the suffixes –zehn or -zig, sechs drops the final –s (sechzehn, sechzig) and sieben drops the final –en (siebzehn, siebzig). ♦ When eins is used in combinations where it does not appear at the end of the word, it drops the final –s (einundachtzig, eintausend). ♦ German numbers between 21 and 99 that are not mulitples of ten (20, 30, 40, etc.) are expressed in reverse: one-and-twenty, two-and-twenty, three-and-twenty, and so on. This includes numbers in the hundreds place, thousands place, millions place, and every set of three digits thereafter. ♦ Where English uses a comma to separate hundreds from thousands, thousands from millions, etc., German uses a period or just a space (e.g., 10.000 or 10 000). Where English uses a decimal point, German uses a comma. When denoting currency, the currency is named where the comma appears. ♦ All German numbers below a million are written out as a single word. Million, Milliarde, and Billion are separate words (82 100 650 = zweiundachtzig Millionen einhunderttausendsechshundertfünfzig). The German Milliarde is equivalent to the English billion. The German Billion is equal to the English trillion. Ordinal numbers follow a pattern of their own. They are created by adding a -t to cardinal numbers under 20 and –st to cardinal numbers 20 and above. For German numbers above 100, the suffix depends on whether the last two digits are below or above 20. ♦ The four ordinal numbers for 1, 3, 7, and 8 (erst-, dritt, siebt-, acht-) are the only ones that deviate from this pattern. ♦ Because ordinal numbers are adjectives and because they are used attributively — i.e., directly before they noun they describe — they also require the appropriate adjective ending. ♦ Ordinal numbers can also be expressed in writing by adding a period after the numeral. When reading these numbers aloud, however, the correct ordinal suffix and adjective ending must be included. The two phrases below are read aloud exactly as the ones above.